Spectacular views and direct beach access await you at Castle Sween, a wonderful 4 bedroom oceanfront vacation home located in the popular town of Corolla. With a private walkway to be beach and a superb view of the Atlantic Ocean from a dune top deck gazebo, guests of this sandcastle can effortlessly dive into a true OBX coastal vacation as soon as they arrive. 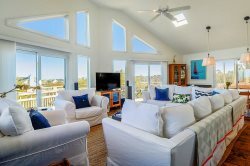 Granted, visitors will be hard-pressed to leave the sunny and pristine Corolla shoreline or the on-site gazebo that’s perfect for relaxing with the latest beach read, but step inside, and you’ll find that this shrine to oceanfront living continues via a spacious and coastally-inspired interior. The second level serves as the main gathering area of the home, with a great room with living, dining, and kitchen areas, as well as two bedrooms that boast a queen bed, and two sets of bunks, respectively. Two more bedrooms are found at the top level, as well as a cozy loft with daybed for a little quiet reflection. With pristine ocean views around every corner, Castle Sween is an artfully appointed paradise for beach fans. With a price that’s almost as attractive as the endless ocean views, Castle Sween is an oceanfront retreat that all vacationers can flock to without going over-budget. Sweetly outfitted with everything vacationers need, Castle Sween is an oceanfront oasis for visitors who crave the beach life.